Accidents and injuries are never planned or convenient. That is why we are open after hours, here to help you when you need us the most. Bone and Joint related injuries are one of the most common reasons people visit the emergency room. For these type of injuries our providers with specialized training in Orthopedics offer a lower cost option with shorter wait times than the emergency room. 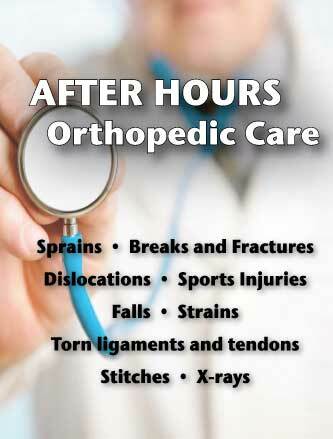 Our highly trained staff treat these type of injuries everyday. On site X-rays, casting, bracing, and minor suture repair of lacerations. Emergency room visits result in higher cost and co pay, longer wait times and unnecessary exposure to infectious disease. Save time, save money, get the right care the first time. Avoid the Emergency Room long wait and high cost!